Do You Roast Marshmallows When There is a Fire? | SeibCo, LLC. Do You Roast Marshmallows When There is a Fire? I was reminiscing with a former coaching client last week and we were laughing at the many stories we had created during the 5-year time period we had successfully worked together. One of the most powerful stories was, he never seemed to worry about anything … when maybe he should have! Many of us worry about things when there is a perceived “fire.” We believe we have no control over our reactions to it. And, instead of investigating the facts, taking proactive actions or appropriately waiting it out, we worry that worst things will happen. Or, if we stick our heads in the sand, we can falsely believe everything is fine and do nothing. While worrying does hinder your ability to achieve results, being too calm can get in the way of doing what needs to be done. Remember, we all have times we worry about our jobs, clients, employees, family members, driving, projects, etc. When we get caught up in this vicious cycle of the bad things that may happen (and many times never happen), it diminishes our ability to make the right decisions, take the appropriate actions and move forward. Minimize disruptions and distractions. Many of these can be avoided. And, you do have a say in making this happen. Remember, when you react to newsfeeds, rings tones and gossip over coffee (to name a few triggers), you are training your brain to overreact … creating a bad habit. *Limit your time on social media and hide negative postings. *Silence your phone for a period of time, or use a different ring tone for those calls you really do need to answer. *Don’t participate in the gossip mill. *Address the worry with your coach or mentor, then, take immediate action steps where appropriate. Practice mindfulness. Being present to what you are doing, who you are talking with and what you need to focus on is important. There are many books and podcasts available to talk you through how to become mindful. Read one chapter of a book or listen to a short podcast each day on this topic. Focus. When you have a goal you are committed to achieving (e.g., being a great boss, partner or spouse; getting the job offer; creating financial stability; etc. ), do not allow circumstances to get in the way. Create a daily intention to support your goal (e.g., I am open and accepting. I believe in me. My employees are great. I am a great boss.). Work with your coach to clarify and focus on the next right actions to take. This will improve your results. 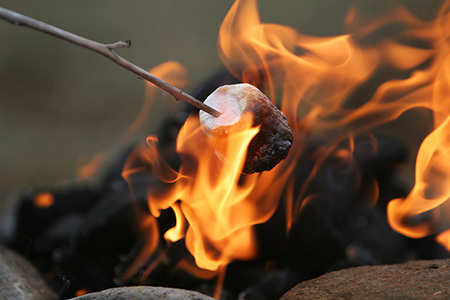 To minimize worrying and improve results, be aware and recognize when you should take different actions due to a real “fire,” or when you should sit and enjoy roasting marshmallows. Jeannette Seibly has been recognized as a catalyst for the past 25 years. As an executive coach, advisor and consultant who provides straight talk with dynamic results. Remember, you can achieve your intended results with help from your coach, regardless of the circumstances. Don’t wait! Step up now! Check out her website, or contact Jeannette for a preliminary confidential conversation.